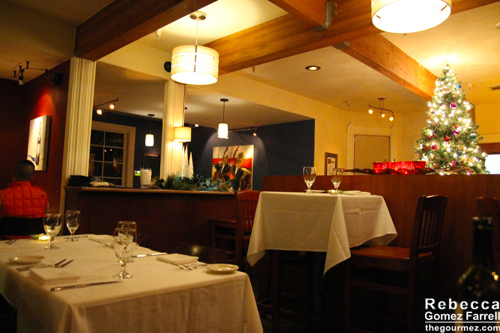 Neumanali is one of Hayward’s few fine dining restaurants. Bijou, just a few blocks up B Street, is the only other one that immediately comes to mind. 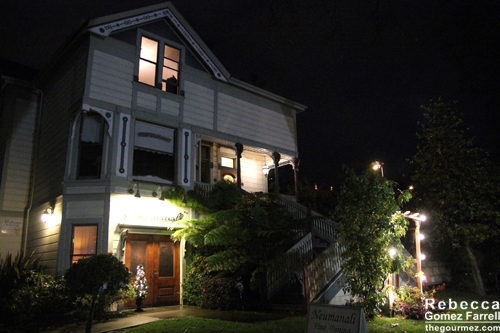 Neumanali is tucked away by the downtown Hayward BART station in a beautiful Victorian that most people don’t even realize is a restaurant as they walk past. I’ve wanted to check it out since we relocated here. Early December, I invited another couple who loves good food to come along. The restaurant had an intimate feel despite the lively large party being hosted that night. Discounting that group and ourselves, there was only one other table used throughout our meal. Neumanali provides typical white tablecloth service despite having a tiny staff. Warm, rosy lighting means photos aren’t as well focused as I’d like, but I’m sharing them anyhow. The walls were forest green and decorated with people-pleasing Impressionist paintings of orchestral groups, except for the bathroom that randomly featured nudes. To my taste, the atmosphere is stuffy but I absolutely want to try it again in warmer weather when we can sit on their lovely patio. Dinner started out great, with us sharing two bottles of Eden Canyon’s Freedom from the Press 2010 Cabernet Sauvignon over the course of the night and enjoying soft, bubbly bread with olive oil, balsamic, and strong garlic. Another commonality shared between Neumanali and Bijou is that both restaurants serve up new American cuisine with an eye toward French preparations. 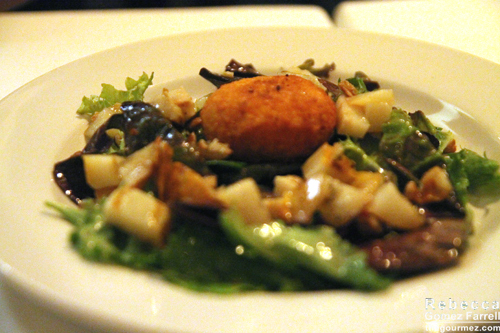 Our friends started with the warm goat cheese salad that comes with grilled pears and mixed greens. Praise of “this is fabulous” and “that was a spectacular salad” rang out, making it one of the most enjoyed courses of the night. Friend #1’s grilled rosemary rack of lamb with roasted potatoes, heirloom grains, and a pomegranate reduction sauce was probably the only course praised more highly. In the forefront of that picture are eggplant chips that weren’t listed on the menu. Friend #1 declared she could eat a whole bag of them. They were thick enough to give her something to bite into while maintaining a delightfully crunchy exterior. She also exclaimed over the heirloom grains, which turned out to be close to a sweet version of rice pilaf. 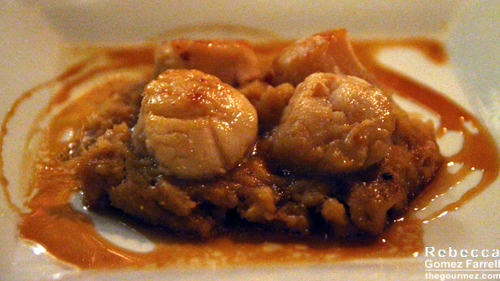 Friend #2’s scallops with sweet potato puree, brown butter, and an apple cider reduction were not quite as successful. While tasty overall, the dish was ultimately too sweet and uniform. The scallops were cooked correctly, reaching a velvety texture, but they offered little to stand up to the intensely sweet puree. From my small bite, I would say the apple cider reduction lost a lot of its vinegar bite that might have cut through all that sweetness. Instead, it simply offered another layer of sweet to the dish. My own trout was also not all it could be. 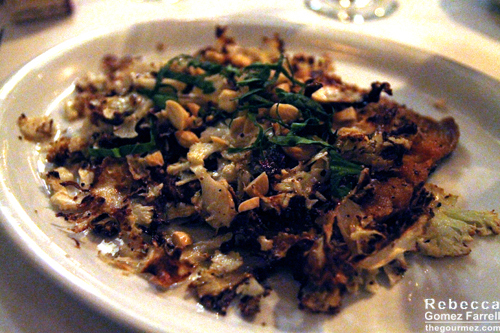 I suspected it would be greasy from the description—pan-fried trout filet with brown butter, crispy cauliflower, Marcona almonds, and watercress—and indeed it was. How else but deep-frying would that paper-thin cauliflower come out so crisp? The cauliflower delighted me and reminded me of onion strings. The almonds were quality as well, but they were a second element that added crunch to the meal and their own internal oil. Combine all that with browned butter and a pan-fried filet, and it’s going to be a greasy—and very French–dish. As I expected that, I wasn’t put off, and I would hope other diners would expect the same from the description, but still…it didn’t have to be quite that much of a fat-appreciation course. I appreciated the simple preparation of the trout, especially how expertly crisped the skin was. The middle of the filet, which was thicker, reached the moist fish-meat sweet spot, and I enjoyed the overcooked edges and skin, but I’m not the typical gourmet in that regard. Friend #2 tried it and was displeased by the dryness. The plentiful use of pepper might also turn off some diners. But I pretty much got what I expected. 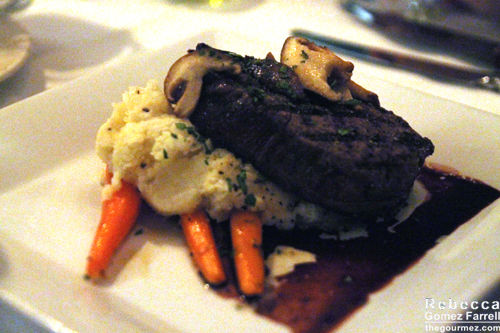 Our final main course was my husband’s filet mignon with grilled baby carrots, whipped potatoes, and a red-wine reduction. Both the husband and our friends thought the cook of the meat was fantastic and enjoyed the rub. It was probably the second-best dish, behind the lamb. 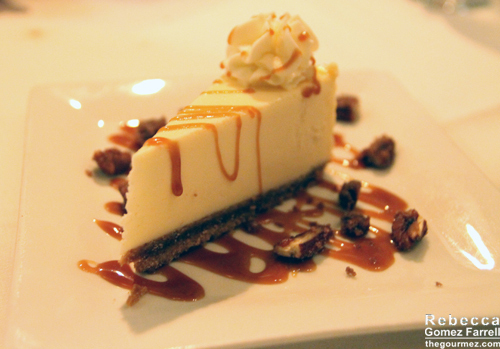 And then came dessert. We tried nearly all of them on the menu. Friend #1 enjoyed the French-style cheesecake, meaning it’s creamier than the hunk of stiff, dense cheesiness that is a NY-style cheesecake. She declared it awesome and the crust especially excellent. 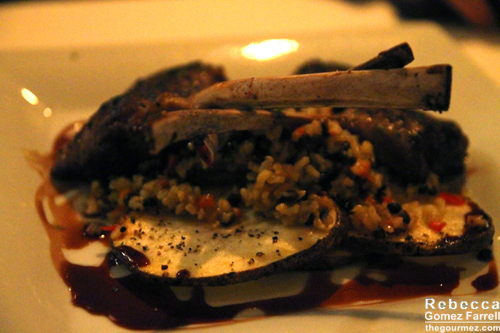 Basically, Friend #1 pulled the jackpot of meal selections between it, the lamb, and the salad. 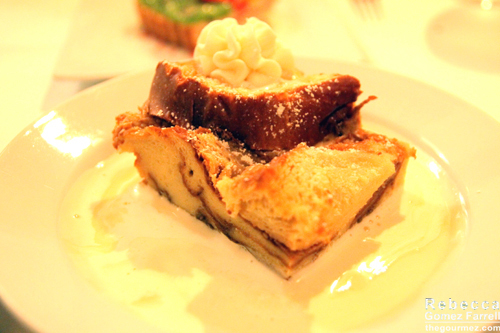 The husband and I, and Friend #2, had the bread pudding. It was closer to French toast than a custardy bread pudding, which was a welcome change from the others I’ve had recently. Crisped edges all around. I was surprised at how thin the crème anglaise was, however, and found it a little too strong on the vanilla side. Friend #2 had no such complaints about the dish, enjoying his thoroughly. 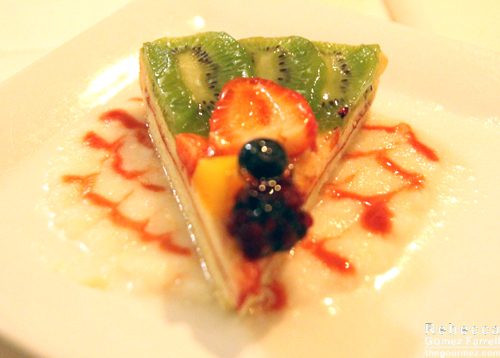 He also dug into the fruit tart that came with a combination of kiwi, strawberry, and blueberry. The strawberries were too sharp, but otherwise, the fruit was good. The tart itself reminded him of a Bakewell tart from England, or a frangipane for those of use more familiar with that term. Basically, a dense crumbly crust made with plenty of almond paste. We certainly tried a variety of Neumanali’s offerings! The salad, filet, and lamb were big hits, and it’s worth noting that those choices best incorporated ingredients that complimented each other. The scallops and trout, while good, could have been excellent if the textures and flavors of their ingredients were more varied. Instead, they came off as bound by one thought for each: sweetly smooth for the scallops and crunch for the trout. My friends enjoyed the desserts a lot, but I like more creativity in the final course of a drawn-out meal. It is the last chance for the restaurant to leave an impression; they should go out with a bang rather than rely on trusty standards. Which all goes to say that I found Neumanali to be a satisfying, and at times impressive, fine dining experience for Hayward. I look forward to trying them again in the spring as the menu changes and the patio beckons. The potential is assuredly there for a meal that delivers on all counts. They already deliver on most.